Hello potential Woodstock Town Band Members..! If you haven't yet done so, please fill out the survey at the link below..! 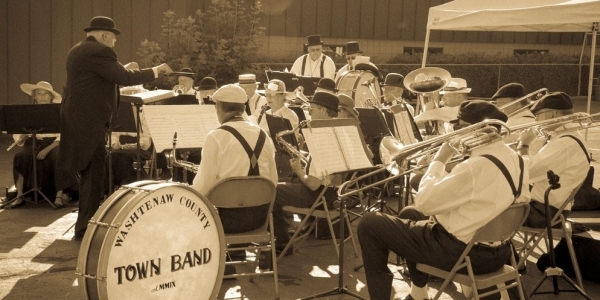 At the top of our list of things to do, is to get a community band set up to start rehearsing regularly, or at least seasonally. * First 30 minutes = Review of some basic band exercises… Planned to include tone production, simple melodies, scales, rhythmic drills, etc… Helping those who haven’t played in a while get reoriented with their instruments and music abilities. * Second 30 minutes = Introduce and rehearse music for potential performance… Engaging in learning and improvement strategies to assist those players who might not be capable in sight reading through such performance selections. * Third 30 minutes = Play through all the music covered to that point in the rehearsal… Allowing more experienced musicians capable of sight reading through the performance selections to participate in the group with an appropriately reduced time commitment. - Those seeking the most time and assistance in the rehearsal opportunity can access that prior to being joined by others who may not need as much direction. - Others who are able to contribute to the group through minimal rehearsal, or even by offering strong sight reading abilities, can be offered those opportunities to participate in that way. Putting this together in Woodstock by working to build a group which can grow together and eventually perform would be a lot of fun! Some terrific potential exists to collaborate with Artistree, the local WCSU school bands, and other entities in our community. We hope to ‘hear’ from you..! Please fill out the online survey to help us gather information about the potential membership. We will be using the following Email to answer any questions you have about this group.